Earlier, we have discussed on how to Setup and Configure the Application Compatibility Toolkit 5.5 and Creating the Data Collection Package to start analyzing the Applications. In this article, we will look at how to analyze this report, and how important is to rationalize and priorotize the applications. We will also look at how to get hints and support from the Community on solving the AppCompat Issues. Step 1: Once the data is collected, the Report of applications would look like this. As mentioned earlier, ACT has an active Community/Microsoft relations which checks and monitors all the applications and provide you ready suggestions to ease the AppCompat Process. For which you will need to Send/Recieve the Reports. Click on the button as shown below. This report will give you information on all the applications which were gathered during the Data Collection Phase. After the data exchange, you will find all the information on Community/Vendor Assesments, Issue reports, Mitigation tips etc.. You also have options to Prioritize issues and apps. Step 3: Lets sort this report upon the active issues now. I see that, there is an application (System Center Configuration Agent) which has 2 active issues. Step 4: You can rationalize application and set the priority on the same. Right-Click on the My Assesment Tab, you will see the below options. You can set these below Priorities for this application. (As the name suggests). For eg: If this application is business critical for you, you can priorotize the same, so that the Application Compatibility team knows this and they take the action first on this! You also have options to categorize the application as, whether is it an in-house, Microsoft or even a Third Party Application. This would be very useful to contact the support / Technical Account Manager to check with the compatible version software. 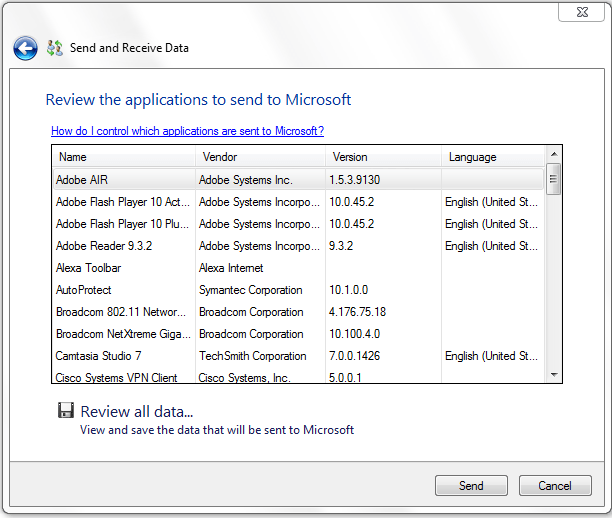 You can also set the deployment Status in the report for periodic updates and references. As I had mentioned earlier, you can control the reports before being shared with Microsoft / Community. For eg: If you have a confidential in-house application and you do not want to share the information about that particular software with Microsoft you can opt to do that. Step 5: Now lets see some detailed instructions on what that active issue is all about. Double click on the application row. It will open another dialog, which provides you information on the Assesment, Issues, Application Attributes, the computer from which this application was fetched. Step 6: Goto the Issues tab. This will list the 2 issues which was found. Double click one of them. This will give you information on the Priority, Severity, Symptoms and causes as well. This will give enough hints on how to fix the issue / work with this application. If you know or come across a solution, you can add your description and method to mitigate an issue. Goto Actions – Add Solution. Similarly, you can also file a new issue and ask the community for answers and opinions. Step 7: Once you complete the work on it, you can also set the Assesment State for that particular application. Right click on the My Assesment Area, select “Set Assesment”. Following this process, you can identify all the issues and rationalize the applications as per your organization/personal need. Posted in How-to, Microsoft, Windows Installer, Application Compatibility and Deployments and tagged AppCompat, howto, Windows 7. Bookmark the permalink.